Salamanca. Short story by Chris Pellizzari. October - The Write Launch. She was scratching his back as the taxi weaved in and out of Granada traffic on the way to the bus station. A flamenco song came on the radio, one Jimmy was sure was being played at that very moment inside the Courtyard of the Lions in the Alhambra. The swords were fresh with blood. These gypsy swords were not yet buried, he told himself. Jimmy turned around and looked out the rear window with Vera’s nails still on his back. He saw the large, dripping orange sun low in the sky and the Alhambra on the hill, the red tower and the flags in the mountain wind. He knew he would never hear the song again. When the song ended, there was no voice to give it a name. It was followed immediately by forgettable Spanish opera. No, he would never hear the song again. He would never hear a song like that song again. It belonged to the ages. When Lincoln died, they said he belonged to the ages. When Garcia Lorca died, they buried him for forty years, forty years in the wilderness, and they still haven’t found his body even though they continue to dig for it. Inside the Granada bus station Vera expressed some concern. “Are you sure we don’t have to book a room? There’s a payphone over there. I can call some of the places he mentions in this book,” she said. She fell asleep shortly after they connected with another bus in Madrid. Jimmy wanted to have a beer with her inside the Madrid station, but she said she just wanted to find the new bus and close her eyes for a while. Travelling through the barren land of La Mancha had made her sleepy. At first, she had been staring out the window and pointing things out to Jimmy, but the landscape began to repeat itself and she grew silent. The night sky was clear in Madrid and the sun of Granada was now replaced by a cool Madrid moon. From Madrid to Salamanca, she snored loud enough for the old woman sitting in front of them to shoot her a look of death. Jimmy just smiled at the woman and stared at Vera. Jimmy did not have the heart to wake her. She told him two days ago she was having a hard time sleeping because her host mother made a lot of noise late at night and early in the morning. Vera ground her teeth and licked her lips between snores. 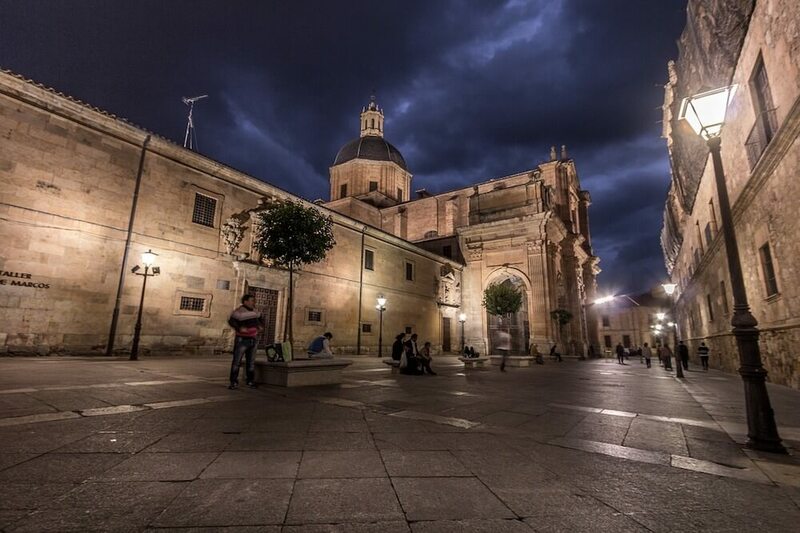 The bus pulled into Salamanca’s station and Jimmy gently shook Vera until she woke up. Her black hair, black enough to be suitable for Andalucia, was scattered in threads that were running across her forehead, eyes, and nose. They were running away, really. Her eyes were still closed when she said, “Are we in Salamanca?” She said it in a voice that was left behind in some inn in La Mancha, where they served potato chips, orange Fanta, and green olives to passengers for a few coins while the driver poured petrol into the tank. Her voice was somewhere in La Mancha, sitting and waiting for something or someone. Jimmy helped her to her feet. “Let’s go sleeping beauty. You were snoring louder than a fat man,” he said. Her eyes were wide now. She seemed embarrassed. Jimmy absorbed the green of her eyes. It was the green of her eyes he first noticed in the Spanish composition class. “Oh my God! Are you serious?” she said. “You’re a window rattler,” Jimmy said in his best John Lennon voice. He did a great John Lennon. “Stop kidding around,” she said as she retrieved her school bag from under her seat. She packed light. Rick Steves would have been proud. It was just one more thing Jimmy liked about her. “Was I really snoring?” she asked. She asked in a way that told Jimmy she was worried he would find her less attractive. She had no idea how much he loved her, he hadn’t told her yet. He was planning on telling her that night in Salamanca. “Yes, you were really snoring. It was kind of cute though,” he said. “Oh, shut up,” she said as she brushed past him, her shoulder knocking into his shoulder and her schoolbag, which was strapped over that deadly shoulder, giving him a love tap in the ribs. She walked down the aisle and off the bus as if she was travelling alone. He chased after her, but not too fast. He liked observing her from a distance. She was the most authentic human he’d ever known. He never thought he would meet a human so authentic, let alone a woman. She walked into the station and waited for him. She did not turn around. When he arrived at her side, she spoke. “Should we wait for a taxi?” she asked, looking across the station. They walked across the small station and exited through a glass door that slid open as they approached it. They were standing on a platform where they had expected to see a line of taxis ready to whisk them away. But there were no taxis. What they did see, after about five minutes, were giant raindrops. It was a slow, loud rain, a different rain from the Gypsy feet pellets of Granada. This was a Holy Procession rain. “Did you pack an umbrella?” he asked. “No, did you?” she replied. “Of course, not” she said. “Jesus, I thought Spain was supposed to be the driest country in Europe. I never thought I would need an umbrella as often as I do,” he said. “Well, now you know,” she said. She hadn’t made eye contact with him since they were on the bus. Now she was staring at cars driving down a slick street in a foreign city, cars that were not taxis, tires that splashed rainwater onto the platform’s curb, miniature waves across an asphalt beach, and she was shaking her head. Jimmy stared at the yellow line that ran down the center of the road as the rain grew heavier. The line was shiny and blurry. “Well, we might as well start walking before it gets even worse,” he said. He wasn’t looking at her either now. He was talking to the sliding glass door. This had the potential to be quite the little disaster. He looked straight ahead. There had to be something out there. “South, we’re heading south. Right now I have more confidence in south than north,” he said. More cars were driving south than north. They had to be going somewhere. “I don’t mind getting wet if we have a destination, but to walk aimlessly in the rain is madness. You’re crazy, Jimbo,” she said through clenched fangs. She had called him “Jimbo” only twice before, once as they walked up a steep hill towards the Alhambra instead of taking a bus, and once when he accidentally knocked over a small pitcher of sangria, most of which landed in her lap, in a restaurant called El Chikito, which was one of the favorite haunts of Federico Garcia Lorca. He never told her people sometimes called him “Jimbo,” because they didn’t. It was something she invented and he wasn’t too crazy about it. “Just shut up and walk,” he said. He knew she would react badly to what he said, but he didn’t care. His top priority was to avoid the rain. He walked under storefront awnings. Every store had an awning. He did not turn around to see if she was following him. She could sleep inside the bus station for all he cared. He passed many storefronts before he heard a splashing sound approach, a splashing sound made by small female feet. He tried walking faster to prove a point, but the splashing grew louder and closer. Finally, he felt a soft punch just below his right shoulder. “So, you were going to leave me at the station? What kind of a man are you?” she asked out of breath. Her voice wasn’t nearly as angry as Jimmy thought it might be. She appeared almost happy to be standing at his side again. He gently pushed her up against a door under a yellow awning. He kissed the top of her dripping head which made his lips, which had, beyond explanation, remained dry during the walk from the station, as wet as the middle of the street. “I’m going to tell you something important tonight. But for now, just grab my hand and we’ll run through this monsoon until we find a hotel. It will be vacant, I promise you. It won’t be long. I want to hold your hand,” he said. He said “I want to hold your hand” in a John Lennon voice. “Can you keep up with me?” she asked with a smile. It had been established a month ago she was much faster than him. She challenged him to a race from the entrance of the Federico Garcia Lorca Park to Lorca’s house, the Huerta de San Vincente, a twenty-second race, tops. She beat him by five full seconds. She took off at full speed and he tried to keep up like a dog on a leash. He could have stopped her at any time, but he let her drag him through the sidewalks of Salamanca because she was laughing louder than ever before. He almost tripped twice, and he would have undoubtedly taken her with him. He could be incredibly clumsy, and you didn’t want to be anywhere near him when he was falling. After five minutes of running, Jimmy heard a car driving up to the curb. He knew it was a taxi. “Hold up!” he shouted to Vera. He was completely out of breath. He squeezed her wrist and gave it a little tug in his direction. He may have been slow, but he could be strong. The little tug was all that was needed to stop her in her tracks. He realized then how much stronger he was than her. He turned around and looked at the taxi’s passenger door, white with a red sash that ran diagonal across it. “We got a taxi!” Jimmy said to Vera. The taxi driver reached over the passenger seat and lowered the window. He was middle-aged and had black curly hair and a thick black beard that covered most of his face and neck. “Do you need a taxi?” the driver shouted through the rain in Spanish in the gravelly voice of the Spanish smoker. “That would be great,” Jimmy shouted back in Spanish. He was still holding Vera’s hand when he opened the door to the back seat. He let Vera in first. “We’re trying to find a hostel. Do you know any that would have vacancies now?” Jimmy asked in Spanish. “Let’s try the Hostal Plaza Mayor. I think it’s the best one for the price and I have a feeling it might have a few vacancies. The weather has been nasty here the last week. I don’t think we have too many tourists now,” the driver said. “Let’s try it,” Jimmy said. Vera placed her head on Jimmy’s shoulder as the taxi slowly moved away from the curb and into the street and rain. Jimmy stared back at the sidewalk. It would always belong to him, Jimmy told himself. The sound of rain against the windshield and the beat of the windshield wipers put Jimmy in a bluesy trance. He felt something he hadn’t felt all day. He felt tired. The driver looked at the radio more than the road. He was listening to the news and he kept playing with the volume. The voice came in strong and then faded away. Then it came in strong again. Jimmy was too tired to apply the proper concentration to translate the news of Salamanca. It was a foreign language during the drive. The taxi stopped in front of the entrance to the Hostal Plaza Mayor. It wasn’t far from the bus station. They could have walked if they had known where they were going. It looked like a hotel, not a hostel. “Are you sure this is a hostel?” Jimmy asked the driver. “Yes, a hostel. The nicest one in Spain,” the driver said in a manner that suggested the topic wasn’t up for debate. “Can you wait here for a minute? I want to make sure there are vacancies,” Jimmy said. “Take your time,” the driver said with a sincere smile. Jimmy opened the door and got out. He took Vera by the hand and helped her out. She hadn’t said much during the ride. Jimmy and Vera entered the tiny lobby. It looked Alpine. There were wooden beams across the white ceiling. The desk in front of the pleasant, smiling old man was solid oak. The hotel key rack behind the old man was solid oak. There were plenty of keys hanging on the rack, a good sign. There was a grandfather clock to the left of the old man. It was taller than him. “Welcome to Salamanca? American?” the old man asked in Spanish. His hair was jet black and thick. It was not the hair of an old man. His face was manly with sharp features, quite handsome. His glasses were not the glasses of an old man either, they were stylish enough for Jimmy to wear if he needed glasses. The only thing old about the man was his age. “Yes, American. We’re from Chicago. Tell me, do you have any vacancies?” Jimmy asked in Spanish. The smile never left the old man’s face. He shrugged his shoulders as if the question was almost silly. “Of course, plenty of vacancies. Don’t worry. How long do you plan to stay?” the old man asked. “At least three nights,” Jimmy said. “Fine, fine. I will need to see your passports first,” the old man said, still smiling, still showing healthy, white teeth. Jimmy gave his passport to Vera. “She’ll take care of the passports and signing in. I need to pay the taxi,” Jimmy said. “Fine, fine,” the old man said. As Jimmy headed out the door, he heard Vera speaking with the old man. Her voice was very pleasant. Her Spanish was better than Jimmy’s. She could speak Spanish in different moods, which is a great demonstration of fluency. Jimmy spoke Spanish in one mood, a wooden presentation, as if he was concentrating too hard on translating the English to Spanish. Jimmy approached the driver and handed him cash, paper Euros, a nice little stash that included a nice little tip. The driver shook Jimmy’s hand. “Enjoy your stay,” the driver said. But Jimmy felt the situation called for more. “Thanks for everything. You really saved us tonight,” he said. The driver rolled up the window and waved at Jimmy one last time before slowly backing away. Jimmy stared at the road that led from the hostel to a sandstone arch. The rain was little more than a refreshing mist now. They could go back out tonight. He was sure the plaza, the most beautiful plaza in the world, was just beyond the arch. He imagined the pictures Vera showed him in the taxi in Granada of the sandstone buildings lit up at night under black and blue clouds. It looked like everything was made of gold. A golden city, Salamanca. He would tell her he loved her tonight in the plaza. The bars would be open late. After they unpacked they would go for a stroll through the plaza and he would find the right bar, maybe there would even be seats outside the bar, seats on the plaza itself, and he would tell her for the first time he loved her. The flamenco song he heard inside the taxi in Granada came back to him now. He told himself, staring at the sandstone arch, he would remember it for the rest of his life but he would never know its name. Chris Pellizzari is a graduate of the University of Illinois at Urbana-Champaign, earning a B.A. in History with a minor in Spanish in 2003. He also holds a Masters degree in Journalism. His short story, “Granada,” was published this fall in the Awakenings Review. Another short story, "The Chicken Basket", was published in the Fall issue of Boomer Lit Mag. Chris has also written for numerous newspapers, including the Chicago Sun-Times, Daily Herald, and Chicago Tribune. Read more articles by Chris Pellizzari. All original work attributed to Chris Pellizzari © 2017 Chris Pellizzari.